I usually don’t believe in horoscopes, fortunes, or anything of that sort. However, when it comes to my Zodiac sign, I’m completely, entirely, wholly, absolutely, perfectly, without exception… a Pisces. If you have ever met me, I swear you’d agree to those traits listed above. Even if you’ve never met me, I’m sure to a certain extent you could see how I could be a Pisces. I did a little research for everyone just so you could get a glimpse of who I truly am. Bolded text is taken from here; the text not in bold are my thoughts and comments. 1. The Astrological birth sign of Pisces (February 19 – March 20) is usually associated with being extremely creative, sensitive, and artistic, as well as a healthy fascination with the metaphysical and spiritual. I am all about being CREATIVE and ARTISTIC! I’m sure you have figured that one out by now, hehe. If you have not seen my creative and artistic side, check out this layout I completed yesterday using the latest from Cosmo Cricket. 2. Pisces are the most intuitive and spiritually developed of the zodiac birth signs. Aptly called “old souls”, Pisces thirst for spiritual knowledge and personal growth. They are the twelfth, and last, of the Zodiac signs, and as such, tend to have a more finely tuned intuition, sixth sense or extrasensory ability to perceive others feelings. Let’s just say that if we got into a long discussion about intuition and extrasensory abilities, you might get a little bit freaked out. For some reason, “I just know”. I can’t really explain it, and I’m sure other Pisces can back me up on this one. Also, I’m a gal of faith; I try to frequently strengthen my relationship with God. 3. The duality of the Pisces personality is best described as a constant ebb and flow, back and forth, straddling the physical, material world and the ethereal, divine realm where Pisces vivid imagination, powerful intuition and creative daydreaming feel like home. 4. Pisces are creators.Pisces are common as inventors, writers, musicians, painters, and dancers. Pisces make great friends and mates. Pisces are extremely loyal and caring. Pisces often possess uncanny intuitive or psychic abilities. Cute stuff, huh?! If you want to buy some of the paper on this layout, I posted links for each patterned paper below. It doesn’t show the backsides to each of these papers, but they are all double sided. …and all three sheets coordinate with one another! Seriously, you won’t regret that you bought it! 5. 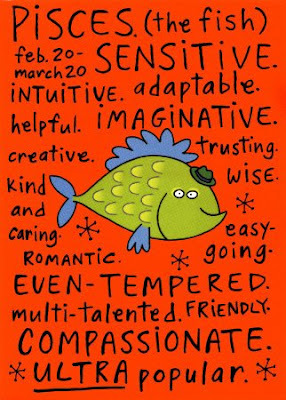 Pisces are sensitive, humane and often idealistic. People born under this sign react emotionally to everything making them compassionate and sensitive to those around them. Rather than taking an analytical approach to life, Pisces react to the feelings of others and as a result can be very influential when they choose to be. In the right situation, a Pisces can be capable of incredible deeds. The positive nature of a Pisces and the fact that they are tuned into the feelings of others makes them socially popular. Socially popular, me?! Ummmmm, I don’t think so… more like I’m the recluse! I feel like I’m shy, but a lot of people tell me that I’m outgoing and bubbly. What an adorable photo of her daughter! …and it matches perfectly with the Kiki Art WATER Rain release. I love the way this one turned out. What do you think? Below are links to the sheets of paper I used. Like the Hot AIR Balloon papers, the images online don’t show the backsides. …and just like everything in life, there’s a counterpart. I’ve got flaws too, lots of them actually. All right… I’ll stop making up excuses. It’s unfortunately true. Even though I’ve got some flaws, I wouldn’t have it any other way. Tomorrow is going to be a very special day. what a fun post!!! I always knew there was something “fishy” about you?! LOL! Happy Happy!!! 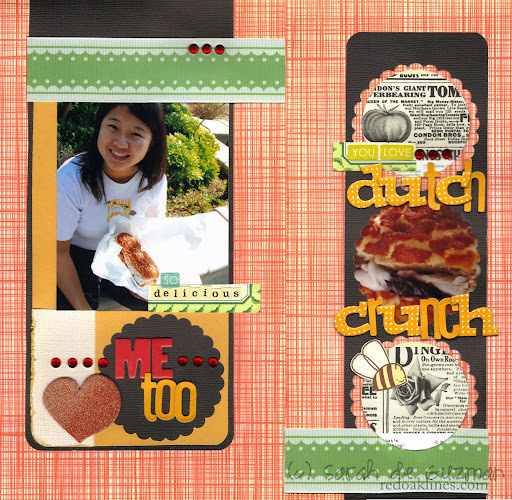 Love your layouts – each is so different but so wonderful – you always create the happiest layouts. Great photos of you too! You are right, the hot air balloon line would fit perfectly with my pictures of my dad in the hot air balloon. The layouts… love love love them… you are amazing… each one is just delightful!!! And the one with my precious Rainee… is just WOW… stunning stunning stunning you blow me away! I love it!!! I love that paper… going to have to get me some… it’s a must have, especially with all this rain we’ve had… Thank you for sharing your beautiful talent!!! All the other traits aside… you are definitely CREATIVE & ARTISTIC. I adore the new LO’s! All so cute, so fun & such great designs (as always!). Michelle is going to ♥ that LO! Great post. How adorable are those Pisces posters?! that is too cool that you are so much like your astrological sign predicts, wow!! For as much as I know you, I think it’s soo right on! 🙂 I think I should have been a Pisces. 😦 I’m a Capricorn and I don’t think it totally describes me to a T like yours does! He he, so fun to read and you are so sweet. Thanks for sharing and WTG girl! Doode! I’m missing a tooth! I look like a nerdy hillbilly. Hahaha. I ❤ the hangover. I love your latest layouts. Sooo glad to be home. Woooo. ok….i have to totally giggle as …. 1) I am reading the first little cartoon with the descriptions thinking to myself the WHOLE time….this is soooooooooooooooo NOT my ADAM at all (he is feb. 20th!) but at the same time thinking…..
4) and loving rainee even more today in the lo U created for michelle…. 5) how come sarah hasn’t done up a brookie lo???? 7) Nooooooooooooo I am NOT cutting down my boy….lol…. 8) VERY FRUSTRATED with my argumentative….moody….annoying…..GROUNDED for a month and kicking my own ARSE for grounding him as I’m the one suffering with his attitude TEENAGE son who HAPPENS to MATCH every description on that second cartoon description of a pisces……..
9) I think to myself….that BRIAN (also a pisces….) DOES NOT FIT EITHER description and …..
10) how the HECK is that possible????? 12) Sarah doesn’t need to wait for a book from me…. Love these 2 LO’s!! They are gorgeous!! Love the colors you used and the adorable pictures!! Have a blessed Birthday and fabulous weekend!! Hehehehe You’re so cute! Love the pics and LOs. heyy this is a great posttt, i don’t believe in this but is funny and sometimes my mom read me my sign, I´m Acuario!!!!!! pretty interesting. following the link now. Sarah! You’re my sista from another Mommy….and Daddy! Ha ha! 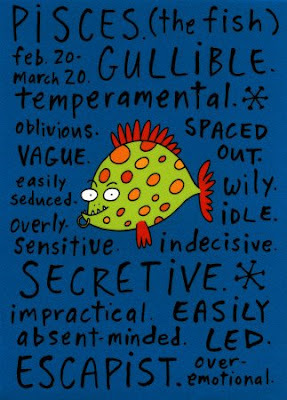 Yes, I find that the astrological sign of Pisces is spot on for me as well. I remember my visit to Cali last year and I was giggling as I read those VERY SAME magnets! And I have SO MANY of those “I just know.” moments…I trust my gut. Are you able to see through fake people? Uh….I DO! Maybe not right away, but after watching for a little and listening…you can pick em out easy! And I’m SUCH a daydreamer!!! And as far as being indecisive…..what helps is going with gut feelings on choices….but in the end it’s not really making a choice….like, “you can only afford to buy ONE whole collection (of a scrapbook line)…..pick one” and i go with the one i’m feeling the most in my gut! Oh girl, I soooo want to meet you one day! Loved that layout btw! And I’m working on a Pisces layout and have been researching myself…I might as well cut and paste your post on my blog! LOL! Have a wonderful weekend!! !